Wasps lock Joe Launchbury says he was "sad" to see Stuart Lancaster lose his job as England head coach. Launchbury, 24, played in all four of England's group games as they failed to qualify for the World Cup quarter-finals, leading to Lancaster's exit. 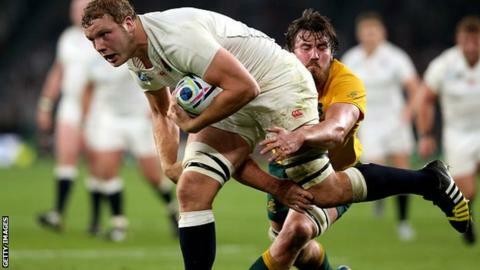 "He gave me my first cap and he's all I've known in an England shirt," Launchbury told BBC Sport. "It'll be different when we go back. "But I'm just focusing on playing for Wasps and putting my marker forward." Launchbury came off the replacements bench for England's first two group matches - the 35-11 win over Fiji and the 28-25 defeat by Wales - before starting the 33-13 loss to eventual finalists Australia and the comfortable victory against Uruguay. Lancaster & England - what went wrong? Having signed a new contract in October 2014, Launchbury is now looking forward to having an influential season with Wasps after spending most of last term out with a neck injury. "I'm fully focused on doing well here, I hardly pulled on the shirt last year and I'm just loving being back," he said. "I've been here for a few years and we've been through some tough times but when I signed up I could see the vision of the club. "If we can keep these results up hopefully we can get noticed outside this circle as well."